Pop Art emerged in Britain and the UK at the end of the 1950s. It wanted to connect art to the ordinary objects of everyday life and with the images of commercial culture. Comics, adverts, mainstream films and television shows were – traditionally – regarded as vulgar and as unworthy of notice by serious, elite artists. Pop Art recognised that they could be charming, beautiful or even quite moving. It started from the generous, democratic insight that the ideas we need might turn up in surprising places. Contemplating the label of a tin of soup can be a profound experience. An image in a comic book might touch us as deeply as the most prestigious works of literature. The ordinary is honoured, as it always should be. 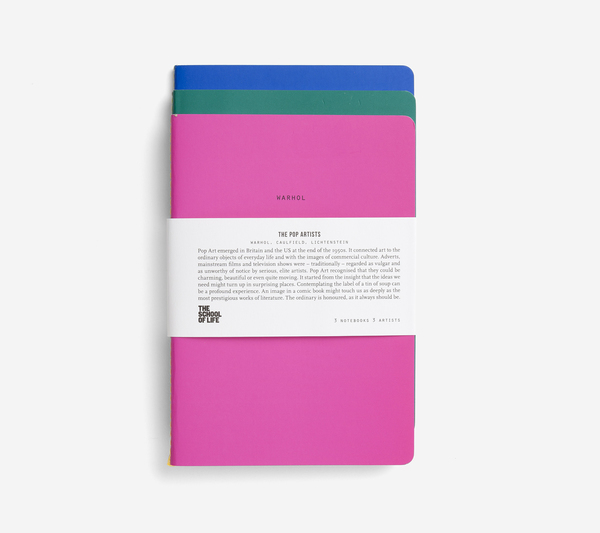 Other School of Thought Notebooks available (see individual listings) in the series: The English Modernists & The Bauhaus. plain, grid and lined paper (one of each): 64pp.